Quonops Online Services is the first user-friendly and all-inclusive underwater sound mapping service designed for regulators, offshore industry, coastal construction companies, marine area managers, spatial planning managers, environment consultancy companies and research. 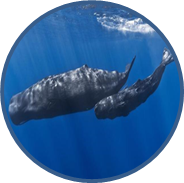 Quonops Online Services provides a fully comprehensive solution to assess distributions of ocean noise, compliance with regulation and potential impacts on marine life. QOS can even be combined with one or several buoys to analyse in-situ measured data. Know the noise situation in your National Waters and help licensing offshore projects. In the European union, be compliant with the Marine Strategy Framework Directive and report to the EU on Descriptor 11 through mapping. Develop a sound action plan that includes the underwater noise issue for marine life. Communicate and inform stakeholders and the public on the noise status of your area. Secure offshore and coastal projects and get them accepted and permitted. Take the right decisions to ensure sustainable development of your maritime activities. Evaluate the impacts of your project towards marine mammals, fishes, larvae and turtles. Increase the scope of your research projects by easily including the distribution and variability of underwater noise. Train your students with a powerful practical tool. The impact of man-made noise on marine life is of increasing concern and regulated in most countries. It is well known that marine mammals and fishes are sensitive to noise. They rely on sound for communication, orientation and detecting prey or predators. Maritime stakeholders have now the obligation to take this issue into consideration. Discover why underwater sound is so important for the marine ecosystem. The noise maps produced are based on the real oceanographic context provided by Copernicus Marine Environment Monitoring Service (CMEMS). 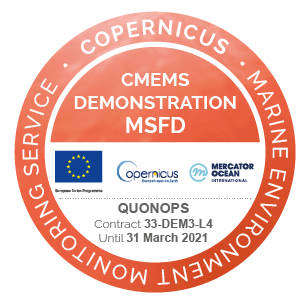 Discover how Quonops Online Services uses Copernicus Marine Service ocean temperature, salinity and surface wave data to map the distribution of anthropogenic and natural noise in the ocean. Quonops Online Service can be combined with the unique worldwide internet-based bioacoustics analysis capacities of Listen to the Deep Ocean (LIDO) developed by the Technical University of Catalonia, BarcelonaTech (UPC) to provide a full comprehensive solution. 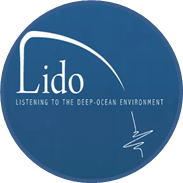 The objective of the international programme LIDO is to develop and apply passive acoustic monitoring techniques of natural, biological and man-made sounds to cabled and wireless monitoring platforms at sea.